There is a feeling of serenity as soon as you walk in the door, it's something to do with the sense of space and proportion..."
Soak in a colonnaded Cleopatra style spa accompanied by surround sound stereo, relax in front of a genuine wood fire, wander past the kangaroos to the waterside restaurant for a leisurely breakfast, or just unwind in undisturbed solitude. 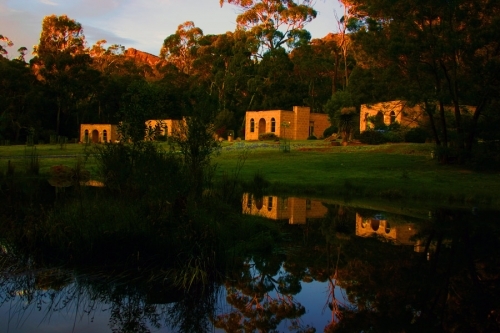 Enjoy good food and wine and a relaxed ambience in the only boutique resort in Halls Gap that offers an exclusive in-house food & wine experience. A relaxed setting by the ornamental lake overlooking the Grampians National Park, the Milan Room is an intimate venue for a romantic dinner. Perhaps you prefer relax, self-cater and be completely undisturbed in one of our fully equipped villas. Marwood combines self contained luxury villas and pavillions for six couples with the added option of a breakfast service or dinner, making the services Marwood provides unique in the Halls Gap area. Low rise stone villas, sympathetic to the surrounds in a superb location whose individually designed interiors cater to the most discerning traveller. Our Tuscan Villas are totally individual, private and luxurious. Marwood offers four individually decorated Villas, hand made terracotta and slate tiles, granite bench tops, huge sofas, Real log fires, forged dining tables, matching chairs, bedside tables. King beds. Australian wool under covers, imported linen, floor rugs. The bathroom unfolds double vanities, a large play area shower. A deep double spa grandly colonnaded sits beside the bed. Experience an overwhelming sense of space, proportion and harmony as you enter through the arched porch. Breakfast with the birds on the patio in fine weather and unwind to the calming sounds of the bush. In the cooler months the mood lighting and crackling log fires create a cosy atmosphere that encourages relaxation. The Water Pavilions introduce another level of innovation to Marwood. They offer all of the facilities of the Tuscan villas and add some unique differences with Egyptian or Indian touches.Water is pumped into a stream that babbles around the sunken lounge before flowing into the lily pond at the front door. The restful sound of bubbling water to eases away stress and tension. A glass step crosses the stream and leads up to the king-size bedroom and the private courtyard beyond. Be as reclusive or as adventurous as you please. Warm terra-cotta, natural slate and polished granite and the forest outside your window. You could not find a better base from which to enjoy a romantic world of authentic experience without compromising on comfort, convenience and warm hospitality.